Washington, DC has one of the largest network of home growers in the country because, well, we don’t really have any other choice. 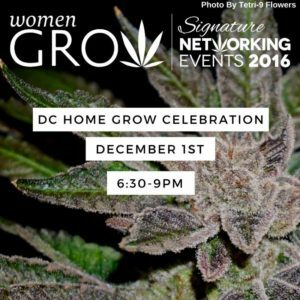 DC Women Grow wants to celebrate all the home growers out there and the giving nature of Initiative 71. We’ll have education stations where DC home growers will be sharing their knowledge. We also have a special surprise for you all in collaboration with Steep Hill. Who attends? You’ll meet women (and men) at all different stages of their career in the cannabis industry. Many will be in the research phase, just learning more about opportunities, while still working day jobs. Some are looking for jobs with existing organizations. Others are starting up their own cannabis venture or ancillary business. Depending on the status of legalization in your state, you’ll also meet cannabis business owners & investors who are well on their way. How can I get the most out of networking events? We recommend bringing business cards and a pen to take notes. If you don’t have business cards, check out Moo for 10% off your first order (and your first order supports Women Grow). Watch our video on networking tips from Women Grow founding members. Are events on different days other than the first Thursday of the month? Women Grow networking events are on the first Thursday of each month (except for holiday weeks). Social events can be planned at other times. Women Grow’s national events are held a few times a year. Make sure you’re on the Women Grow mailing list to receive invitations.